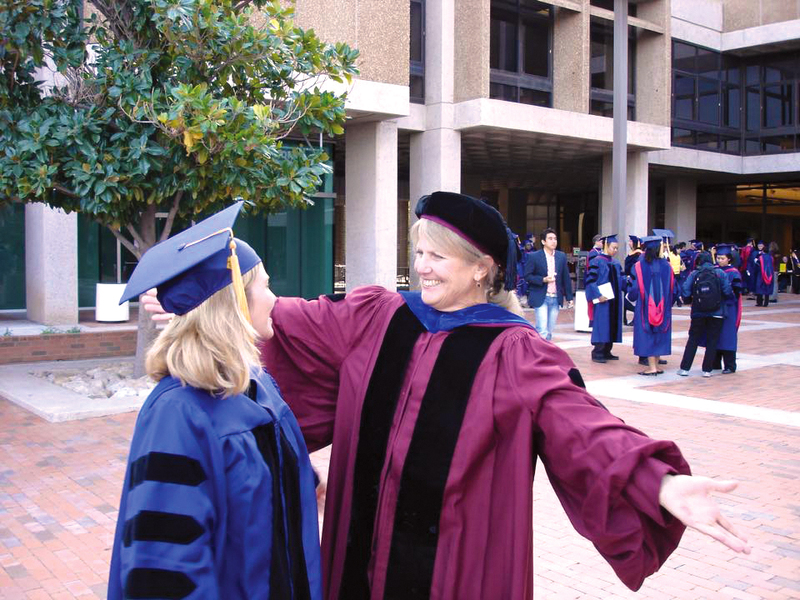 Barbara Babcock (right) is remembered by her students as a passionate and supportive mentor. Barbara A. Babcock, UA Regents' Professor Emerita of English and Comparative Cultural and Literary Studies, and former director of the graduate program in Comparative Cultural and Literary Studies, passed away from natural causes on Feb. 6 at her Tucson home. She was 72. A pioneer in cultural studies and symbolic anthropology, Babcock was a former president of the Society for Humanistic Anthropology, a former director of the Pembroke Center for Teaching and Research on Women at Brown University and a former Distinguished Ford Foundation Visiting Professor at the University of Chicago. Babcock came to the UA in 1980 after a year at the Institute for Advanced Study in Princeton, three years as an assistant professor at the University of Texas, Austin, and after earning a Ph.D. with honors at the University of Chicago. She rapidly established herself as a major scholarly force – campuswide, statewide, nationally and internationally – in folklore studies, comparative cultural studies, the Native American Southwest, the study of Southwestern and Native American women, and the theory of sign-systems in literature, anthropology and material culture. Babcock took the lead in establishing several of these areas as prominent subjects of university study in America and around the globe, and it was the worldwide recognition achieved by this pioneering work that helped lead to her appointment as a UA Regents' Professor in 1993. As Distinguished Professor Roy Wagner of the University of Virginia put it in recommending her for this highest UA honor, her “work introduced anthropology to many of its current central themes – reflexivity, textuality, the ludic but also concretizing facility of metaphor – before anthropologists had taken their measure. … (The result was) a style of wisdom in which the literary and the anthropological (became) inseparable." Professor Richard Bauman of Indiana University was even more emphatic in supporting her for Regents' Professor. To him, Babcock was "a truly gifted scholar, at the leading edge of the emerging rapprochement between literary and anthropological theory." In one academic year alone, 1986-87, Babcock received the Southwest Book Award for her now-classic volume "The Pueblo Storyteller"; a Wenner-Gren Foundation Grant for "Daughters of the Desert: Woman Anthropologists and the Native American Southwest, 1880-1980," a museum exhibit with a catalog and then a book; and the Award for Excellence from the Society for Visual Anthropology for "Southwestern Women Anthropologists: Reflections and Reminiscences," a videotape that achieved international circulation. Other influential book-length publications Babcock authored include "The Reversible World: Essays on Symbolic Inversion"; "Signs About Signs: The Semiotics of Self-Reference," a special issue of the journal Semiotica; "Inventing the Southwest: Region as Commodity," a special issue of the Journal of the Southwest; "Bodylore," a special issue of the Journal of American Folklore; and "The Great Southwest of the Fred Harvey Company and the Santa Fe Railroad." She also authored over 75 book chapters and articles. In addition, she was a frequent consultant for, or curator of, major exhibits displaying the material culture of Native Americans and other cultural groups for UCLA's Fowler Museum, the National Museum of Women in the Arts in Washington, D.C., the Museum for African Art in New York, the Wheelwright Museum of the American Indian in Santa Fe, the Heard Museum in Phoenix and the Arizona State Museum. Many of Babcock's colleagues, at the UA and across the country, feel that they owe her a great deal in their own careers and scholarship. Distinguished Professor Houston Baker at Vanderbilt University, remembers: "When I set out to order some of my own research on Ralph Ellison for a PMLA (journal) article, the work of Professor Babcock constituted one of my greatest scholarly assets. … I am enormously indebted to her, and I am sure that I am not alone in my indebtedness." Her UA colleague Jerry Hogle, University Distinguished Professor of English, remembers his great debt to her, too. "I found her to be a truly magnificent – and seemingly endless – fountain of knowledge about folklore, the special nature of Native American storytelling, theories about cultural iconography, feminist and gender-related theory and criticism, and the very nature of symbolic art and material culture," he said. "Because I was able to work, talk and co-teach with her and follow up on reading that she gave me in abundance, my thinking and my own scholarship – and ultimately my teaching – were, as in Yeats' 'Easter 1916,' 'changed utterly' into the 'terrible beauty' of something at least approaching real cultural critique. I will never forget all that I learned from a mind so capacious, readings so informative, and a colleague so generous with her knowledge." Born in Danfield, Pennsylvania, on Aug. 7, 1943, Babcock is survived by her brothers, J. Bradley Babcock of Lemont, Pennsylvania, and Dr. John Reed Babcock Jr. of Loveland, Ohio, as well as her younger sister, Susan Babcock Hoover of Bellefonte, Pennsylvania. The family asks that donations in Babcock's memory be made to the Heard Museum, Emerge: The Center Against Domestic Abuse, Pima Animal Care Center or the Arizona-Sonora Desert Museum. "(Her) scholarship and her feminism inspired me to enter the CCLS (Comparative Cultural and Literary Studies) program and undertake an arduous journey to a Ph.D. in 2005. … She had a wonderful discernment for the layers of humanity within art and culture and an eloquent talent for explaining these insights. It is inexpressibly sad that the world has lost a courageous, passionate teacher and writer. Learning from her, I myself became a more dedicated teacher and community member." "My Ph.D. would never have happened without Barbara. She supported me in incredible ways and gave me the intellectual guidance I really needed." "Barbara was a mentor, teacher and friend. She opened my eyes to the complexities of cultural expression, for which I have never been the same." "She was a great teacher and mentor. More than anyone I know, she was skilled at reading ancient traditions, popular culture, politics, literature and the stuff of everyday life." "Barbara was such a giving person to everyone she met. She not only taught interdisciplinary studies, but she lived it – always reflecting on how energy, creativity, communication, wisdom and culture played roles in her life. … Her legacy lives on in her scholarly work, helping us understand our ‘patterns of culture’ all around us." "All of my work has been made possible by the intellectual and cosmological foundation I received in Barbara's classroom. … We are so beautifully encircled, I think, by her love and influence. We are all her legacy, and it is a very fine legacy indeed that she left to us."